Growth in the industrial sector along with increasing inflow of investment in the mining sector are some of the key factors which are driving the growth of Coupled Self priming pumps in India. 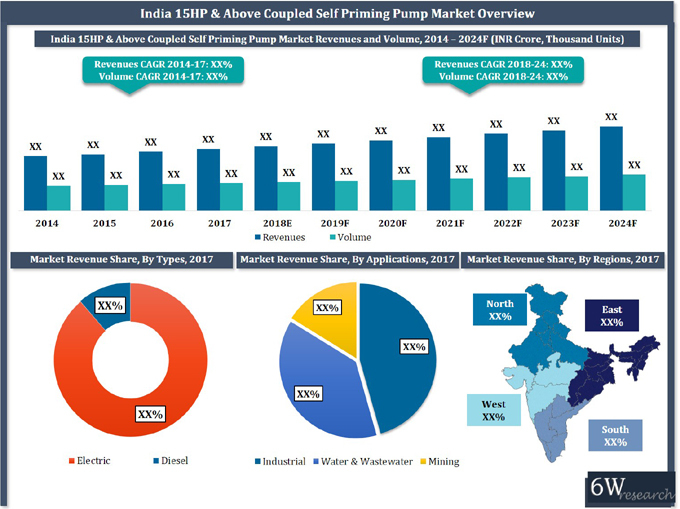 In India, industrial application accounted for highest market revenues in Coupled Self priming pump market due to growing industrial and manufacturing sub-sectors such as electronics, pharmaceuticals and transport equipment. According to 6Wresearch, India 15HP & above coupled self priming pumps market size is projected to grow at CAGR of 4.5% during 2018-24. Indian market registered a modest increase in demand for Coupled Self priming pumps during 2014-17 after experiencing a slowdown post the implementation of Goods & Services Tax. The market is anticipated to maintain a steady growth over the coming years. Industrial application would remain at the forefront of driving the market for Coupled Self Priming pumps in India; however, water & wastewater and mining applications are also anticipated to contribute significant share in the market. In India, the Eastern region held largest India 15HP & above coupled self priming pumps market share on the back of increasing infrastructure development and mining activities. The Eastern region is expected to lead the market in value terms during the forecast period as well. The India 15HP & above coupled self priming pumps market report thoroughly covers the 15HP & Above Coupled Self priming pumps market by types, applications, head range, HP range and regions. The India 15HP & above coupled self priming pumps market outlook report provides an unbiased and detailed analysis of the India 15HP & above coupled self priming pumps market trends, opportunities/high growth areas, market drivers, which would help the stakeholders to device and align market strategies according to the current and future market dynamics. 13.2 Crompton Greaves Consumer Electricals Ltd.
13.4 Xylem Water Solutions India Pvt. Ltd.
13.5 WILO Mather And Platt Pump Pvt. Ltd.